After some initial issues with the PSD I finally figured out how to upload my first character. Ahaha…. I’m a wittle late, huh? 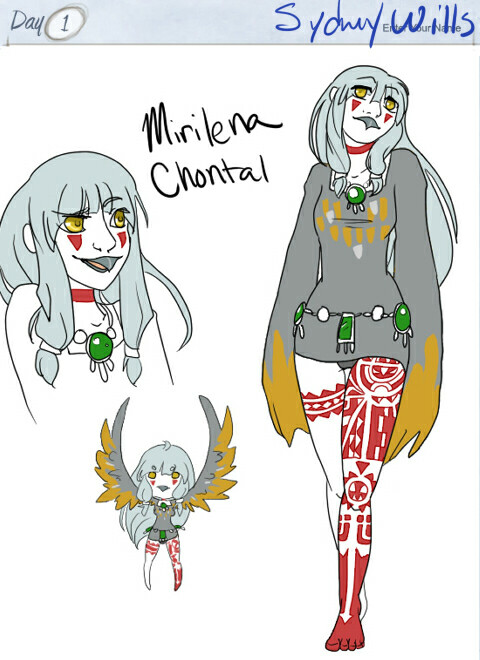 Mirilena Chontal comes from a tribe of people who are extremely in tune with nature. They hone their senses by tattooing themselves with meaningful symbols and markings that resemble a living thing. Plants, animals, it doesn’t really matter. Older people of her tribe are covered head-to-toe in tattoos and most of them aren’t quite human anymore. Mirilena had always been fond of owls, and although she’s still pretty young, many of the owl’s traits are beginning to show through. The people of her tribe believe her to be a prodigy. I'm 18 years old and a full-time college student. I'm beating my way through my first year of college but alas!- I have not had a single chance to draw! I've joined the challenge to re-ignite my passion for art. QAQ Ohmygosh thank you so much! I really had no idea where to go with the colors and actually forgot to color several sections…. -w-; But I’m glad it works~! Wow! She’s so wonderfully unique! Love the lip/beak so subtle yet great touch! Her tattoos are amazing! Great job!